Although adult onset Diabetes Mellitus has been recognized since at least the third century BCE, it is generally considered one of the modern diseases of degeneration. In recent years there has been an explosion of Non Insulin Dependent Diabetes Mellitus (NIDDM, adult onset,Type 2 diabetes ) worldwide as increasingly sedentary lifestyles and diets of refined foods with increased caloric value have prevailed. The number of diabetics has been projected to increase from 135 million in 1995 to 300 million in 2025. The concentration of diabetics is fairly common in Europe, North America, Australia and Latin America, and is rapidly increasing in Asia, with lesser concentrations in Sub Saharan Africa. Type 2 Diabetes has many causes and seems to be based upon diet, genetic predispositions and lifestyle issues. Since ancient times it has been correlated with obesity and in Galenic, Ayurvedic, Traditional Chinese and Unami medicine it has been treated with combinations of diet, exercise and herbal medications. Obesity and abdominal fat deposition are however correlated with a version of angiotensin-converting enzyme gene, so diabetes may be also due to genetic causes. , Diabetes has in the mid 20th century been seen as a dysfunction of pancreatic islets which were believed not to produce sufficient insulin, resulting in hyperglycemia. This has gradually given way to seeing the problem as one of reduced insulin sensitivity in the cells which do not make use of what may be high levels of insulin in the blood. More recently diabetes has been identified as one possible expression of generalized endothelial cell dysfunction due to inflammation which expresses itself as insulin insensitivity. Interestingly enough Traditional Chinese Medicine identifies heat (inflammation) as a major feature in the traditional patterns of diabetes. Recently the understanding of the role of incretin hormones which enhance insulin while slowing gastric emptying and repairing the pancreatic beta cells may explain the actions of some of the antidiabetic herbs, particularly Pata de vaca and Dragon’s blood. It is too soon to tell the role of herbs on these poorly understood hormones. Traditional Chinese Medicine focused upon diabetes or Xiao Ke, most probably Type 1 diabetes or late stage Type 2, as a wasting and thirsting disease that reduced body weight and it was described in texts from around 600A.D. In 752 A.D. Wai Tai Mi Yao included pig pancreas as an ingredient in his Xiao Ke chapter in a formula which is also found in Sun Si Miao’s texts. He also mentioned that diabetes was indicated by sweet urine and suggested testing it daily by tasting. Traditionally Xiao Ke was considered a disease which reduced weight via the pathological mechanism of yin deficiency. Herbs like Opiophogonis and Asparagus root for yin deficiency have some benefit for Type 1 diabetes, but do not yield good results for Type 2 diabetics without a substantially different structure of balancing herbs. Since obesity is only now becoming a major problem in China, the oldest strategies do not work as well on Western populations as do modern Chinese medicine treatments. Currently blood movers and herbs that transform (Chinese) phlegm are used to better effect. There are 13 major pathogenic patterns in modern TCM which can be roughly grouped into upper burner (Lungs/polydypsia), middle burner (Stomach/polyphagia) and lower burner (Kidney/polyuria) forms. Of these only the lower variety is attributed primarily to Yin vacuity, although Yin vacuity may be present in most forms. The upper burner patterns are attributed to depressive heat in the Lungs (which involves phlegm), and are typically treated by formulas like Qing Bu Fei Tang (Clear the Lung decoction) modified with American ginseng to nourish Yin. The middle burner forms are attributed to heat accumulation in the Spleen and Stomach due to overeating greasy foods and abuse of alcohol. The excess accumulations will cause Yin vacuity, but must first be dispelled or the Yin vacuity will get worse. The lower burner patterns consider Kidney Yin deficiency as a major pattern, increasing urination and impairing the Spleen’s ability to metabolize nutrients. The patterns include Lung heat with fluid damage, Stomach heat accumulation and exhuberance, Spleen qi vacuity, Liver depression qi stagnation, Liver depression transforming into heat,Qi and Yin dual vacuity, Heart-lung dual vacuity, Heart -spleen dual vacuity, Noninteraction of the Heart and kidneys, Liver blood vacuity, Blood stasis, Phlegm dampness and Phlegm heat. Among the “food cures” typically recommended in China is a thick starchy soup called congee, made with rice, Job’s tears or barley and with additions of rhemannia, ophiopogon and panax. It seems counterintuitive to prescribe a rice or barley based food, but congee is approximately 1/5 as dense as the cooked grains and displaces the denser food. It would not make sense to add congee to a typical American diabetic’s low carbohydrate diet unless a cereal were being displaced. In Ayurvedic medicine in India and Nepal, diabetes (madhumeta, or “honey urine”) was known early and was identified by the predelictions the ants had for someone’s urine. It was seen as a result of blockage to the vessels and ducts from increased bile secretions. When someone who was obese and had a strong digestive energy (kapha or kapha/pitta natured) constantly ate fat or sugary foods, bile increased to digest the fats and weight gain ensues. Secretions increase and the mucous membranes and arteries work overtime, creating more kapha. These increased secretions, somewhat like the TCM concept of phlegm, can block the vessels and slow things down. Although Ayurveda does not have the concept of insulin resistance, it may metaphorically refer to what we know is the blockage at the membrane level. The disease was described at the time of Charaka and Susruta about the 6th century B.C. It was classified into basic types with very different types of treatment. The Vataja disease looked at honey–like urine as a sign that the blood lacked “grease”. When grease is insufficient the body draws it out to the tissues and the blood sugar becomes like fruit juice. It is considered desirable to have some grease to be normal. Greaseless blood sugar cannot be absorbed by the tissues and thus goes out through the urine, where the ants rush to it. Therefore eating more greasy foods and less sugar was the treatment plan, sort of an Atkins-like diet. The grease (typically ghee and unrefined sesame oil) slowed down carbohydrate breakdown, lowered the sugar/fat ratio of the total diet and lowered the glycemic index of the foods. The Kaphaja type, which tends to occur with larger, more obese people, required eating lighter diets and exercising more. They found that the vata treatment did not work well because Kapha people had voracious appetites and greasy foods added to a typical rice-based diet caused obesity. So later sages proposed a garlic/shilajatu/triphala pill and walking treatment. They made pills of garlic, a nourishing laxative called triphala which is made from three fruits high in antioxidants bound to tannins and shilajatu, a mineral accretion. Diabetics had to walk the mountain trails from village to village, taking the garlic pills four times a day, eating only what they could beg and performing religious observances at each village temple. The curative regime for Kapha diabetes would reduce cholesterol and improve circulation via the garlic treatment, and improve insulin sensitivity through mineral replacement, exercise and weight loss. Since the cure involved walking up and down mountains, the exercise had the benefit of including both resistance training and aerobic benefits. Resistance exercise burns blood glucose directly and trained muscle mass is more insulin resistant. This took three years in Nepal and when the patient returned they were reportedly cured. 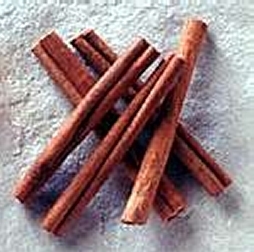 Cinnamon-Cinnamomi cassiae is the common herb with the highest impact on blood sugar and cardiovascular disease markers that are influenced by insulin. It increases insulin sensitivity by phosphorylation of the insulin receptor. Aqueous extractions also increase glucose uptake and glycogen syntheses and appears to help trigger the insulin cascade system. In bulk form it can form a gel which may slow gastric emptying and avoid an insulin spike. It has been used for diabetes, particularly the kidney deficient forms in Chinese medicine. It contains stimulating essential oils, warms the middle and increases metabolism. Its methylhydroxy chalcone polymer (MHCP) has been found in a study by Richard Anderson of the Beltsville Maryland US Agriculture Research Service Nutrition Laboratory to restore insulin sensitivity to cells and increase glucose processing by up to 29 times. Doses of 6 grams, equivalent to a tablespoon a day for 40 days reduced triglycerides, reduced total cholesterol by 26%, LDL cholesterol by 24%, fasting glucose by 29% and maintained improved levels after a 20 day cinnamon-free washout period. Lower doses to ½ teaspoon/1 gram were also effective, but at dose-dependent levels. Cinnamon bark from the outer layers of the tree (Rou gui) is more warming than culinary inner bark (Tian zhu gui) and may be of greater impact based upon the precepts of Chinese medicine particularly in older diabetics with impaired Kidney yang. Cloves- Syzygium aromaticum or/Eugenia caryophyllata Thumb, has been studied for its ability to scavenge free radicals and inhibit the formation of AGE, a biomarker in diabetes. This would be useful for preventing endothelial inflammatory damage. Anderson’s study found that cloves have proven insulin-enhancing activity but at lower levels than cinnamon. It is carminative and enhances digestion, antibiotic and may lower inflammation due to vascular infection. This is a penetrating herb that can carry medicinals to the tissue level by enhancing circulation. Onions and Garlic Allium cepa and Allium sativum have significant blood sugar lowering activities. While allyl propyl disulphide and allicin are considered the active constituents, flavanoids and many other constituents are believed to play a role in lowering blood sugar. APDS lowers blood sugar levels by competing with insulin for insulin-inactivating sites in the liver which increases free insulin. Allicin has a similar action. Garlic and onions have cardioprotective effects including lowering lipid levels, inhibit platelet aggregation and are antihypertensive. Onion extracts affect the hepatic metabolism of glucose and increase the release of insulin or prevent its destruction. Raw garlic is generally much stronger than any encapsulated version because the volatile constituents oxidize easily. Turmeric root, Curcuma longa, is a strong scavenger of free radicals, a source of potent flavanoids and is useful in weight control . Recent studies indicate that the addition of 10% of pipli long pepper, black pepper or other sources of piperine make ground turmeric root as potent as a 40x standardized extract. (Curry powder typically has pepper together with turmeric.) In Chinese medicine turmeric is used to invigorate the blood and enhance circulation. Broadhurst, Polansky and Anderson did find an insulin-enhancing effect that was less strong than cinnamon . There are extensive studies on turmeric in Indian journals, but little published on diabetes specifically is available in this country. Nonetheless it is used traditionally for diabetes and weight control. Ginsengs. Panax ginseng is especially useful for type 1 diabetes because it lowers blood sugar and generates fluids, but in NIDDM is less useful because it can induce hyperinsulinema. It does lower blood sugar control at doses of 200 mg. per day and increases energy. In another study panax ginseng liquid extract at the dosage of 0.5 mg twice a day reduced blood glucose in mild diabetics by 40-50 mg/dl and the therapeutic effect lasted two weeks. Moderate diabetics showed little change in blood glucose but had improvement in symptoms. There is a biphasic effect on the cardiovascular system: at low doses it increases the contractility of the heart, constricts blood vessels and increases blood pressure while at high does it does the opposite. Panax has been shown to lower cholesterol and triglycerides moderately as well. For most patterns of diabetes panax needs to be balanced with cooling herbs. Panax cinquifolia, American ginseng, does not appear to increase serum insulin and is used to generate fluids and reduce inflammation, lower blood sugar and increase energy with less heating effect. Bitter Melon, Momordica charantia, is a tropical vegetable widely cultivated in Asia, Africa and South America which has both traditional use and modern studies confirming its antidiabetic actions. Chantarin is a hypoglycemic agent composed of mixed steroids that is more potent than the drug tolbutamide. It also contains polypeptide P which lowers blood sugar levels when injected into IDDM patients. It may potentiate insulin, chlorpromaide, glyburide or phenformin. Because it’s bitter properties stimulate secretions from taste it is best administered as a food instead of as an encapsulated herb. Gymnema sylvestre. A number of commercial sources promote the Ayurvedic herb Gymnema sylvestre for insulin resistance. However Gymnema works like insulin at removing glucose from the blood and does not improve insulin sensitivity of the cells. The use is strictly modern as Gymnema was not used traditionally for diabetes and traditional Ayurvedic doctors consider it a misuse of the herb. Gymnema can in fact hasten the destruction of the pancreatic islets since in early stage NIDDM, insulin secretion is profoundly elevated but not enough to overcome the insulin resistance of the cells and stimulating pancreatic insulin can wear out the pancreas. Gymnema acts in humans to increase the already elevated insulin. It does reduce blood sugar, but much of the damage of NIDDM is due to hyperinsulinema rather than blood glucose. By inducing serum hyperinsulinema it may also increase the atherosclerosis and vascular damage. There is some information that Gymnema administered in a form that can be tasted anesthetizes the sweet taste buds for several hours and it is used by the Gujarati Indians in fresh leaf form for this purpose. This effect is not present when the herb is encapsulated. Dragon’s Blood or Kino, Ptreocarpus marsupium, is a gum resin used long in Indian medicine for diabetes. It contains the flavonoid (-)-epicatechin which prevents alloxan-induced beta cell damage in rats. An ethanol extract of the bark and the isolated epicatechin have been shown to regenerate functional pancreatic beta cells. No other drug and one other herb has been shown to generate this activity. In TCM dragon’s blood is used to invigorate the blood, as a circulatory stimulant. Blueberry leaf Vaccinum spp. has been used in Native American traditional medicine for lowering blood sugar. Huckleberry leaf tea is used similarly by African Americans and is one of the most popular herbs sold in herb stores in the Baton Rouge Louisiana herb stores according to prominent herbalist Michael Tierra . An unnotated reference in Weiss’s herbal compendium indicates that “Huebner demonstrated that long-term use of bilberry leaves caused severe hydroquinine poisoning.” However this is not borne out by traditional use and there has been no recent research on the subject. Recent evidence suggests that Vaccinum leaf works at the expense of inducing hyperinsulinemia. Bilberry fruit, Vaccinum myrtillus and other spp. has been studied extensively as a source of flavanoids with particular affinity for the eyes, useful in preventing diabetic blindness. The proanthocyandins are believed to be the major factor in preventing blindness from retinopathy. Bilberry jam was issued by the British RAF to pilots in order to improve night vision. When grown in the wild in the US, bilberries are called huckleberries. Blueberries, cranberries, elderberries and blackberries are believed to have similar properties. Pedra hume caa, Myrcia salicifolia- is known as “vegetable insulin” and may be the strongest insulin-like herb. Phytochemical analysis of pedra hume caá reveals a high content of flavonoids, flavonols and flavanones, and some benzenoids. In 1998 Japanese researchers discovered a number of novel compounds. Documented actions include aldose reductase inhibitor, alpha-glucosidase inhibitor, antidiabetic, antidysenteric, antioxidant, astringent, diuretic, and hypoglycemic properties. Plant constituents include beta-amyrin, catechin, desmanthin, gallic acid, ginkgoic acid, guaijaverin, mearnsitrin, myrciacitrin I-V, myrciaphenone A, myrciaphenone B, myricitrin, quercitrin. Pedra hume caá has been used by indigenous tribes in the rainforest for diabetes, diarrhea, and dysentery. It has had a place in Brazilian traditional medicine for many years. Dr. G. L. Cruz, a leading Brazilian practitioner and herbalist, nicknamed it “vegetable insulin” in 1965. In a 1990 double-blind placebo clinical study with normal and Type II diabetic patients, pedra hume caá (3 g powdered leaf daily) demonstrated the ability to lower plasma insulin levels in the diabetic group. In a 1993 study, 250 mg/kg of a leaf extract demonstrated the ability to reduce polyphagia, polydipsia, urine volume, and urinary excretion of glucose and urea in diabetic rats. The extract also inhibited the intestinal absorption of glucose. This study concluded that “aqueous extracts of Myrcia have a beneficial effect on the diabetic state, mainly by improving metabolic parameters of glucose homeostasis.” It is not known if this herb will aggravate beta cell exhaustion or cause hyperinsulemia. However its use in combination with Pata de vaca may mitigate such effects..
Chickweed , Stellaria media, is used frequently to reduce fatty deposits but is little researched. It’s demulcent and diuretic effects may make it useful in diabetes as part of a larger formula. It is anti-inflammatory, antihistaminic, cooling and an appetite suppressant. It can also increase energy. The herb is ubiquitous, growing in lawns and meadows, but it deteriorates rapidly. Its 95% water content makes it difficult to tincture properly. It thus is best administered as a fresh vegetable or in juices. Bay Leaf, Lauris nobilis- has astringent, diuretic and digestive qualities and is a good appetite stimulant. Bay leaves in aqueous extract help to regulate the body's level of insulin. Bay leaf contains up to 15,000 ppm. of 1,8-cineole (bacteriocidal, anesthetic, anti-allergic compound. Bay Leaf contains parthenoides that inhibit platelet cells' release of serotonin, a neurotransmitter playing a causative role in migraine. Bay Leaf has also been shown to help the body process insulin more efficiently, which leads to lower blood sugar levels. Bay Leaf has also been used to reduce the effects of stomach ulcers. Bay Leaf contains eugenol, which has anti-inflammatory and anti-oxidant properties. Bay leaf is also an anti-fungal and anti-bacterial. Bay Leaf has also been used to treat rheumatism, amenorrhea, and colic. Witch Hazel. Hamamelis virginiana is not traditionally used for diabetes although Anderson et. al found that it increased insulin response in rats. Topically an aqueous alcohol extract is used for diabetic ulceration. Ginger, Zingiber officinale, in a daily dose of 10 grams powdered administered to CAD patients produced a significant reduction in platelet aggregation, but did not affect blood lipids or blood sugar compared to placebo. Fenugreek, Trigonella foenicumgraecum, was shown to reduce blood lipids without addressing HDL-c in CAD patients who also had NIDDM. When administered to non CAD patients with NIDDM it also reduced blood sugar. Known active constituents are trogonelline, nicotinic acid, coumarin and glactomannan which has been shown to lower blood glucose levels . Allspice- Pimento dioica or officinalis has been studied for its ability to scavenge free radicals and inhibit the formation of AGE, a biomarker in diabetes. This would be useful for preventing endothelial inflammatory damage. Costa Ricans use Allspice to treat indigestion, flatulence and diabetes and it is believed to lower blood sugar and to enhance protein absorption. Many of the constituents found in the allspice are also found in peppers. Stevia rebundia has been promoted in the popular press to increase glucose tolerance. However the studies have been equivocal and it seems not to be good for diabetic use. Many noncaloric sweeteners have been observed to raise blood sugar by taste alone. In fact the sweet taste of the stevia leaf has been known to increase blood insulin in anticipation of sugar that is not forthcoming. Insulin-dependent diabetics who have taken too much insulin sometimes swish it in their mouth to prevent hypoglycemic crash. Brickellia terniflora and grandiflora are used to lower blood glucose, but I have only found information on their use in a Spanish language study that concluded that chloroform extracts of B. terniflora were able to lower serum glucose by 58.6% in rats with induced diabetes. The mechanism was not explained in this study but I have undocumented information that it suppresses liver enzymes related to glycogenolisis. Stinging nettles, Urtica diocia, is a major source of minerals including trace minerals in a bioavailable manner. It is used to supplement calcium, chromium, magnesium and lithium in diabetic patients. To my knowledge there are no studies confirming this use in diabetics but the USDA database indicates very high mineral and trace mineral content which could be useful in insulin resistance. The seeds have been shown to significantly improve kidney function and to reverse vascular damage to the kidneys. .
Devil’s Club, Oplopahnax horridus is a tall thorn covered aralia, cousin to the ginseng family, which grows in the Pacific northwest. Oplopanax has a tradition of use among the Tlingit, Kwaikiutl, Skagit, and many other nations within its range. It has been used as a blood purifier, pain reliever, tonic, and digestive aid, as well as being used for controlling blood sugar levels. It is classified as an immunomodulator, an alterative and an adaptogen, It has a reputation among herbalists for lowering blood sugar better for Native Americans than Caucasians and works better in formula than alone for blood sugar reduction. Little has been published on the herb and its formidable habit of growing in thick thorny clusters (with thorns on leaves, stems and roots) makes commercial cultivation undesirable. It has the potential to be over harvested so is best left to local use. Ginkgo biloba leaves have limited use in traditional medicine, where the nut is more frequently used, but have been identified by German researchers since the 1960s as a circulatory herb. It increases blood flow peripherally to the limbs and brain, decreases the time it takes for re-innervation of muscles following traumatic nerve damage, is antioxidant, anti-inflammatory, antithrombotic, antiatherosclerotic and an antagonist to platelet activating factor. Ginkgo is used for cerebral vascular insufficiency and impaired mental performance. It has the ability to increase blood flow to the brain, especially in the elderly, decrease platelet aggregation and prevent strokes and other diseases related to emboli. It has been successfully used for migraines due to its ability to stabilize platelets and serotonin levels in the brain, thereby normalizing blood flow. It is also used for diabetic retinopathy, retinal insufficiency, macular degeneration, cataracts, intermittent claudication, Raynauds disease, varicose veins, generalized peripheral arteriopathy, and erectile dysfunction Although ethanol extracts have been used clinically, most German research is on the standardized extracts which have been altered to reduce urishol, which can cause headaches or allergic reactions. British herbalist David Hoffman maintains that the “traditional” use of ginkgo leaves is as a standardized extract. Alan Keith Tillotsen, Traditional Ayurvedic Doctor, comment. Alan studied Ayurveda in Nepal, apprenticing for many years to Dr. Mana, a well-known classical Ayurvedic doctor. He claims that he has not had the nerve to recommend the three year mountain climbing cure to his diabetic patients in Delaware. J Agric Food Chem. 2000 Mar;48(3):849-52. : Insulin-like biological activity of culinary and medicinal plant aqueous extracts in vitro. Broadhurst CL, Polansky MM, Anderson RA. Nutrient Requirements and Functions Laboratory, Beltsville Human Nutrition Research Center, Agricultural Research Service, U.S. Department of Agriculture, Beltsville, Maryland 20705-2350, USA. Broadhurst et al, op cit. Cusin, I., Rohner-Jeanrenaud, F., Terrettaz, J., et al., "Hyperinsulinemia and its Impact on Obesity and Insulin Resistance," International Journal of Obesity and Related Metabolic Disorders, 16(Suppl 4), 1992, pages S1-S11. Mary Conolley , ND, personal comment. Having once attempted to harvest it and receiving numerous puncture wounds and scratches, I prefer leaving it to the native Americans. Comment at the 1999 Green Nations Gathering. Standardized extracts are denigrated by herbalists since the natural balance of constituents is considered necessary and standardized extracts are frequently made of inferior or unripe herb and beefed up with the marker constituent. Further the pharmacokinetics of encapsulated standardized extracts tend to be less effective than traditional tinctures and decoctions.